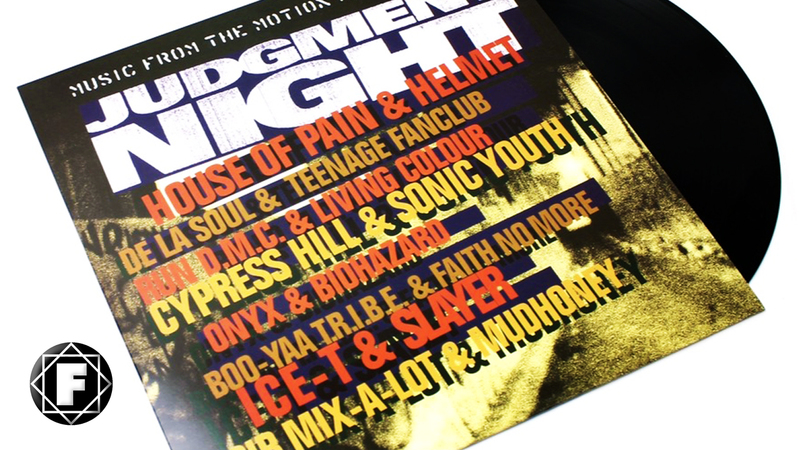 FAITH NO MORE | Judgment Night Soundtrack Released 24 Years ago. In 1993 Immortal Records and Epic Records released a genre changing album which inspired a generation. 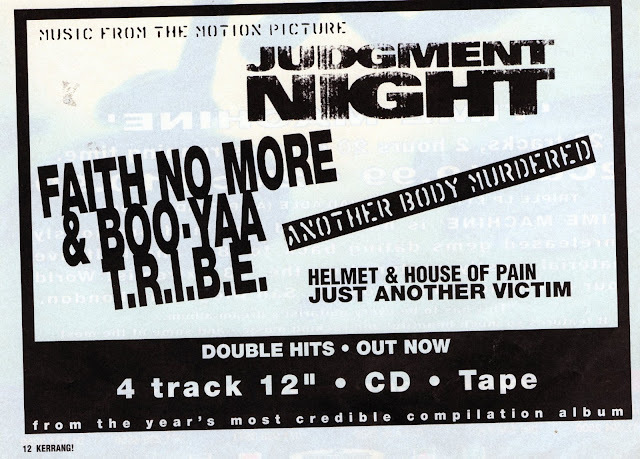 The soundtrack to the film Judgment Night was a collaboration between hip-hop artists and alternative rock/alternative bands which of course included the brutal song Another Body Murdered by Faith No More and Boo Yaa T.R.I.B.E. 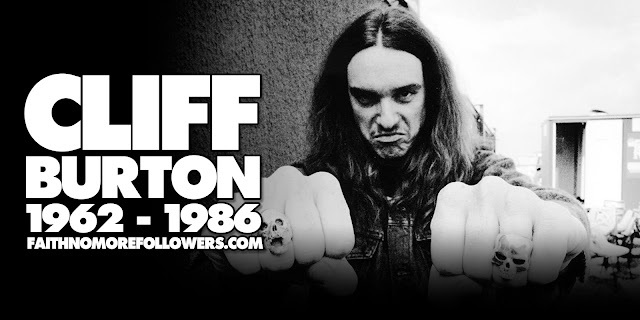 The concept of mixing rap and rock was not a new by any means but this album took the most cutting edge artists of each genre and brought them together for an unprecidented eleven track killer record. The soundtrack overshadowed film itself, a dark thriller directed by Stephen Hopkins and starring Emilio Estevez, Cuba Gooding Jr., Jeremy Piven and Stephen Dorff as a group of friends on the run from a gang of drug dealers (led by Denis Leary) after they witness a murder. NEW YORK—Ranging from bunts to grand slams, the tracks on the "Judgment Night" soundtrack on Immortal/Epic Soundtrax drive home the possibilities of rock/rap fusion. The creative matchups on "Judgment Night" are Mudhoney with Sir Mix-A-Lot; Living Colour with Run DMC; Dinosaur Jr. with Del Tha Funkee Homosapien; Therapy? with Fatal; Pearl Jam with Cypress Hill; Helmet with House Of Pain; Faith No More with Boo Yaa T.R.I.B.E. ; Slayer with Ice-T; Biohazard with Onyx; Teenage Fan Club with De La Soul; and Sonic Youth with Cypress Hill. The first single, due to drop in early August, will be "Just Another Victim" by Helmet & House Of Pain. The movie, "Judgment Night," is an “urban suspense drama” starring Emilio Estevez, Denis Leary, Cuba Goading Jr., and House Of Pain’s Everlast. The Universal release hits screens Oct. 22. Walters, who also helms Buzztone Management (Cypress Hill, House of Fain, Funkdoobiest), says, "Since I manage Everlast, it sort of came to pass that [my record label] would handle the soundtrack." 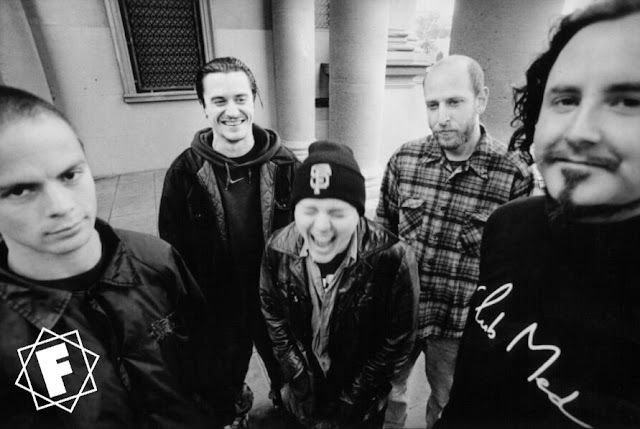 The idea for a set cross-pollinating alternative noise with rap expression grew out of Walters realization that "a lot of alternative artists dig hip-hop and a lot of hip-hop artists like alternative. It kind of made sense to do something that brings the [two teen genres] together." The process of translating his vision into reality took six months to complete. It Involved hard planning and heavy negotiations. "First I had to get a hold of the managers and get them excited about the project" he says. Once that was achieved the artists also had to be stirred. "Next the labels had to give them permission to be on the album. Then the artists' publishers had to grant sync fees and licenses for the songs to appear in the movie. And to get songs recorded, we had to work out logistics. It was hell. A lot of people didn't think I could pull it off." Walters says he succeeded with help from other artist managers linked to the project. To assist the creativity of the performers, who recorded from locales all over the world, Walters says he provided them scenes from the movie complete with notes explaining the shots. The task of "spotting" (selecting where the songs would be used) was carried out by Karen Rachman, music supervisor for the film's producer, Largo Entertainment. The soundtrack will be boosted by to a comprehensive campaign that will target anyone who wants to hear good music, Walters says, "It will be marketed as an album featuring 10 of the best hip-hop artists working m with 11 of the best alternative artists." A videoclip will support the first single, which will be promoted at college radio and on the alternative and hip-hop sides of the industry. Epic and Immortal will split the promotional duties. Metal and hip-hop remixes will be made available. Plans are to herald the arrival of the album with a party hosted by Fab 5 Freddy of "Yo! MTV Raps” and "Headbangers Ball" host Ricki Rachtman. classic album that i still spin tracks from today.